How Much Is My Blank Coin Worth? A blank coin (technically it is called a planchet if it has an upraised rim on it) is worth a few dollars, perhaps $2 to $4 if it's clad, more if it's silver. The Sacajawea, Presidential, and Native American Dollar coins all use the same type of planchet and these coins are worth anywhere from twelve dollars to fifteen dollars. Larger coins usually sell for more. A penny blank will sell for between two dollars and three dollars. A larger coin, like the Eisenhower dollar, or sell for between $20 and $30. If your blank coin has a reeded edge on it, you're dealing with something entirely different. Most likely, someone sheared the metal faces off the coin, or ground out the devices and polished the surface, because of the way the U.S. Mint makes coins, it is impossible for a planchet to be blank and still have reeded edges since the reeded edges are created at the same instant the coin is struck. In other words, there is a round piece of metal inside the coining press with the hole machined into the center which is the exact size of the coin. For plain edge coins, the whole is smooth. 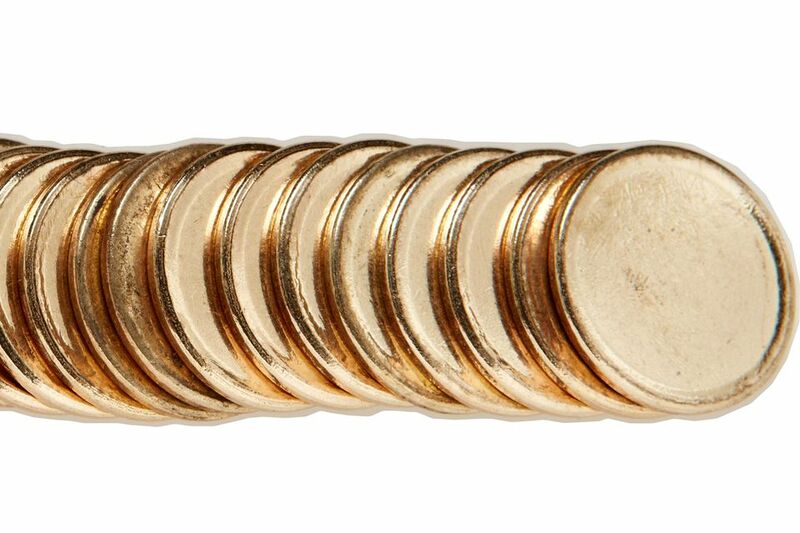 For reeded edge coins, the whole has the vertical grooves machined into it which will in part the reeding on the coin when it is struck. However, Presidential and Native American Dollar coins have a letter edge. The lettering on the edge of these coins are added to the coin in a separate process after the coin is struck. There have been several blank Presidential and Native American Dollar coins that were never struck but have a letter to edge. They are worth up to $100 a piece because they are very rare. Once again, beware of coins that have been altered by an unscrupulous person grinding off the details on the obverse and reverse side of the coin. There are some known coin striking issues that can result in an almost blank planchet with reeded edges. If you see a faint, but very blurry or weak impression on the planchet, it might be a die adjustment strike, which is worth $20 to $40 depending on the type of coin and depth of strike. Before a coin press is put into full operations, a mechanic at the mint must adjust the press to strike the coin properly. A few test strikes are done to see if the coin dies are too far apart. If they are, it leaves a faint image of the coin on the blank. Another possibility for almost blank coins is a strike-through error, where something got in between the dies and the planchet surface, such as cloth or grease, when the coin was struck thereby obscuring or obliterating the devices (or parts of them.) The value of these varies based on the degree of obstruction and eye appeal and can run from $2 to $40 depending on what it was struck through. If your blank coin doesn't even have the upraised rim yet, it's technically a coin blank. If it is made of silver, it is almost impossible to authenticate, but if it's clad, an expert on error coins could authenticate it, in which case (if authentic) it's worth maybe $50 or more. Keep in mind that a genuine coin blank will have a rough, perhaps sharp edge, and the blank may be off-color or grainy looking, depending on what part of the coin blank processing phase it was in when it left the mint. Beware of nice, shiny looking coin blanks with no upraised rim and a smooth edge. These usually just counterfeit blanks made to deceive vending machines. In all matters of this sort, it's best to get your blank coin looked at by an expert. You can find a local PNG Coin Dealer, or send the specimen to a specialist in minting errors for an opinion. As a third option, if you can post a photo in a coin collecting forum and describe it very carefully there, and perhaps we can provide some additional information.